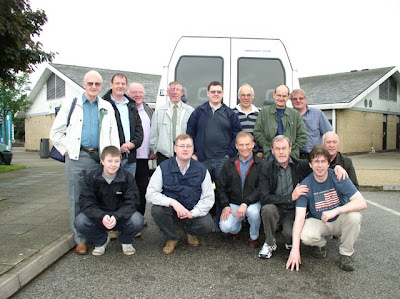 The top picture taken by Bob Jones (remotely) shows the collection of North East Group members who made the trek south to see Roy Jackson and Geof Kent at their base in the 'shed'. The one above is an action shot of 55006 'panned' by Stephen Harold. What an experience and a cracking day out it was. More pictures will follow in different posts I'm sure but we all enjoyed the company and hospitality of Roy, Geoff, the team and the supporting ladies. We were treated to, amongst other things, the thundering sound of 55006 The Fife and Forfar Yomanry hurtling around Roy's magnificent layout. 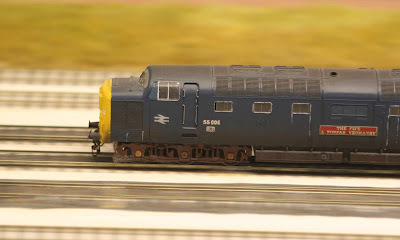 You could have been forgiven for thinking the Deltic was DCC, but no, just the reverberation of its two motors resounding through the baseboards..! Also, in a quieter corner, Blakeney went about its business as ever impressing all who lingered. You lucky so and sos! Meanwhile I was up to my neck in woodworm, dust, and filth generally!! This week I will be getting some modelling done after an enforced hiatus; work, holidays, work, more work...! Look forward to seeing the other photos.